I'm happy to say I've got a really nice little print for the "Print Offer" coming up on Friday. It's a picture I've come to love, and the print is a little beauty, a little gem. Unlike the offering on the 15th, it's not something anyone will already have. If you're a baseball fan at all, especially, keep alert. There was a tiny little controversy—not even as much as a tempest in a teapot—over my decision to offer a fine print of Dorothea Lange's "Migrant Mother" two weeks ago. A few people worried it might not be legal (it is) or ethical (it is) and a few others opined that it wasn't quite the right thing to do anyway (I disgree, but hey, fine, they're entitled). The thing is, pace Ansel Adams, a print really is a performance. Take a look at this pair of pictures. 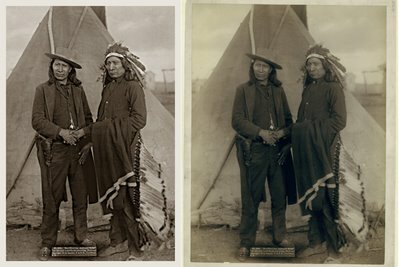 The photograph is by John C. H. Grabill, and it's entitled "Red Cloud and American Horse, the Two Most Noted Chiefs Now Living." That was in 1891. Ansel said the negative is the score; in this case, the score is a TIFF filed downloaded from the Library of Congress website, which is on the right. On the left is a small JPEG of an in-progress file I've been working on to make a print out of. It's not finished yet. It may not get finished, either: the TIFF file is a so-so scan of an old, damaged print. The print, like most photographs, was not particularly well-made in the first place, and it shows all sorts of defects: water damage, metalizing, discoloring, fading, and a maddening number of flaws—some in the original negative, some in the original print, some in the scan, some not showing up except in my contrast-enhanced rendering of the scan. I worked on and off for two days on spotting the #$%! thing. There's still some left to do. What I think I'm doing, anyhow, is this: printmaking. I like printmaking. I like it because I like to look at prints. If I spend five hours of my life re-working a nasty old TIFF from the LoC, it's because I like the picture and want to look at it more often, that's all. The argument could also be made that what's being done is rescuing. Sure, nothing you can download from the LoC website is literally in need of rescuing—except perhaps from obscurity, from being overlooked, forgotten. 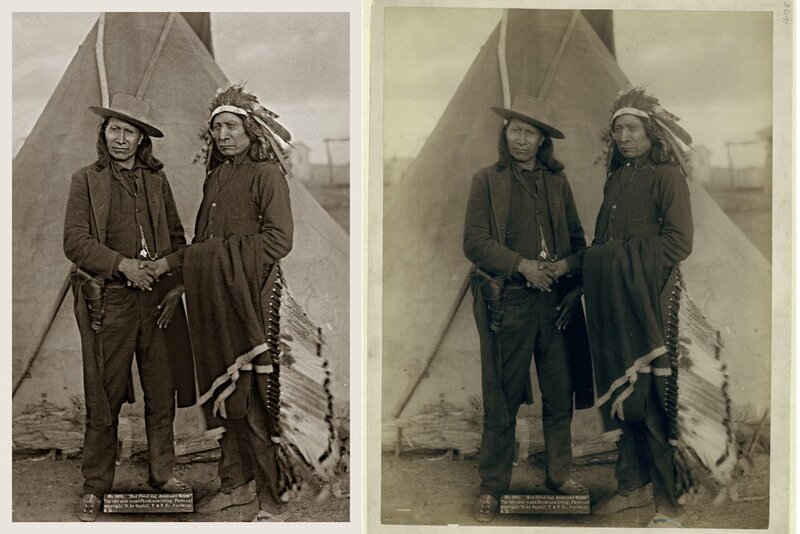 (Had you ever seen Grabill's portrait of Red Cloud and American Horse before? I hadn't. I've known about and admired Red Cloud for a long time, though.) There are tens of thousands—hundreds of thousands—maybe millions of fine old photographs languishing in archives, museums, libraries, historical societies, and estates all over the world. I could work for the rest of my life on making prints of pictures just from the LoC collection, and never make a dent. Why not resuscitate a few nice ones for a frame on the wall of a few of the more discerning households here and there? So, you're saying, fine and dandy—but what the heck has all this blather got to do with "Migrant Mother"? It's a very famous photograph and doesn't need rescuing from anything. The answer there is...well, not to be immodest, but I'm good at this. Not the best, mind you—I'm not that immodest—just very good. At printmaking, I mean. And this is where interpretation comes in. I like interpreting pictures as prints—performing them, Adams would have said. Running them through my own aesthetic filter, putting my stamp on them, eking out their expressiveness, finding the balance I think is just right. Let's take Migrant Mother, for example. I'm going to exaggerate these two details, to make my point, but I think you'll see what I'm talking about. The change is slight, and either one works fine technically. But the higher contrast version changes her expression. Are you seeing that? Yes, it's the same exact information—but it feels subtly different. Look at them together. In the top picture, she looks more resigned, forebearing. In the bottom one, she looks more worried, more anxious, maybe even a touch angry. It's easy to analyze why: the higher local contrast emphasizes both the lines in her forhead and her upper lip. By darkening the upper lip, her frown is emphasized; her mouth in the top picture could almost be of a mouth in a resting attitude, whereas the bottom one seems more like an active expression, actively displeased. And bringing out the lines on her forehead makes her worry more exaggerated. It's a subtle thing, but it's definitely something any viewer would sense in looking at a fine reproduction. This isn't a technical issue at all, really. It's pure interpretative. In making a print I'm not thinking how I want the contrast to look, I'm thinking "what makes her expression the most eloquent?" I don't want to overcook the local contrast on her face, because then, sadness and worry overwhelms stoicism and forebearance, and you don't want it to. All those elements should balance: it's what give her face in the picture such tremendous richness. It's not just a matter of the contrast, it's a matter of the effects of the contrast. In my version of Red Cloud and American Horse, for instance, I'm just not feeling the cold and the wind of the prairie quite as much as I do from the original. It seems a little too flat, a little too pretty. Is it too brown? I'm going to have to figure that out. Featured Comment by Robin Dreyer: I don't see any ethical problems here—I'm just glad to see someone recognizing photographic printing as printmaking. I love to print—I have friends who are printmakers in the classical sense (i.e. etching, litho, etc. ), and I've always seen a connection between what they do and what I do. I also supervise the printing of publications, and when I work with printers, I'm aware that they, too, are printmakers. What ties these things together is the shifts and the interpretations that happen when an image is translated from one material to another. It's printmaking. Mike, now I know why Brett Weston destroyed his negatives. You can make all the arguments you want about why it's a good thing you're reinterpeting someone else's work, but wihout their explicit consent I feel it's trampling on artistic moral rights even if the artists are long gone. I believe you when you say your printing skills are excellent. However, I'd much rather you were printing your own work (which personally is much more interesting to me) or printing someone else's work at their request. Surely, in your sizable audience there must be several fine photographers who would be grateful to have you print and showcase their work. Thanks very much for this series, Mike. When cropped (as shown in "A History...") it can almost be mistaken for a modern day fashion shot - and then you discover the cruel reality behind it. Hits you like a hammer. That's not quite what he said. While I do not have a problem with reprinting and reinterpretating of the old photographs - in fact, I think that the new interpretations such as yours help us understand the photographs more fully - I agree with Adam's assertion that the negative/print relationship is comparable to that of the score/performance, but disagree with the implication that Adams is suggesting that his negatives should be reinterpreted by other "performers" in the way that music composers require (or at least did in the past) and expect music performers to realize their compositions. In fact, one of the significant differences between arts like photography and arts like performed (as differentiated from played back) music is that in the former the artist controls all aspects of the work and creates it exactly as he/she sees it at the time; in the latter the composer imagines what it will become when performed by others and in fact requires the cooperation of these others for the full expressive realization of the work. Mike, You're right 100%. Well, at least I feel exactly the same. I feel breathing new life into an old image is such a wonderful thing to do. And the Library of Congress is a miracle of a source. I found a picture of Mount Aconcagua (tallest mountain on western hemisphere) that I fell almost instantly in love with (there are only two). And to think that someone must have gotten there a 100 years ago with his large format camera, probably on a mule, to record an image that I can finish now is almost like being part of it. I see some people might not like the idea of printing someone else's work. But that's another work. More than ever, I think printing is an art form on it's own. I guess if we didn't dare to interpret Beethoven we would have missed a lot of good music. I have to agree with "photo-essayist". I know that printing and selling public domain archival images is legal. I can also see that you're having fun with your new printer and Photoshop. But is this work for which you'll really be proud to be remembered? I strongly suspect you'd have as much fun, and perhaps gain some new photographic perspectives, from printing your own work. Adams didn't just say it once, he said it many times. And the idea that "the artist controls all aspects of the work and creates it exactly as he/she sees it at the time" is a relatively recent one, relatively rare in practice. In fact many photographers had very little control over how their work was reified. The FSA prints, for example, were not printed by the photographers except in isolated instances. "Surely, in your sizable audience there must be several fine photographers who would be grateful to have you print and showcase their work"
I should mention that that's just what this Friday's print is. It's not one from an archive such as the LoC. The photographer is being sent a proof for approval, too. I do completely agree with you, following Walter Benjamin et al. I don't really believe in author's moral rights as a barrier against reinterpretion. In fact I think most modern art is sampling in one way or another, and photograpy in itself is even more sampling than any other form of artistic expression. I can understand why photographers and art gallery owners love limited series and printings, but I am sure they go against the very nature of the medium. As for printing, hardly any of the great photographers went into the darkroom by themselves. Of course they oversaw what the printers delivered, but I feel that recent printings of old negatives often surpass the original vintage photos qualities. For every Brett Weston who destroys his negatives so no one else can print them, there's an Ansel Adams who leaves his negatives to an educational institution with the expressed wish that others take a turn at interpreting them. Brett's move was far more radical and much more the exception than the rule--and it offended many photography lovers, historians, and artists. You also have to put it in its larger context. Brett's father Edward's negatives had been being reprinted by his brother Cole for many years, and his nephew Kim, Cole's son, is a photographer. There may have been special dynamics at play in the Weston clan, and specific emotions that led Brett to do as he did. Insofar as the music analogy was brought forth here, how does Mike's printing of other photographer's pictures differ from a band getting paid to cover other musician's songs--the cover band? I have to say that I love taking pictures but once I'm done with post processing and in some cases printing, I want to look ahead and take more photos. Therefore I do not mind if someone then 'aids' me in printing and in some cases retouching or selecting prints that are of interest. I once had a very bitter argument on this subject at a Christmas Eve party. People expressed real hatred for Turner's colorization of old B&W movies (which I agreed with) but they also felt that the law should be changed to forbid it. They argued that the colorization defied the artist's original intent. I argued that Turner had purchased the rights and that it remained possible to see the originals if one wished. I subsequently made an artwork that was a long essay on the subject with some (color) painted B&W negative strips glued on to it and an arificially colored Apple Imagewriter printed phot of my family (this was years ago). The essay contained injunctions from the artist forbidding the artwork to be diplayed or even removed from its envelope. I also pointed to many art objects which we wouldn't have if their rules were imposed: Duchamp's "LHOOQ," Woody Allen's "What's Up Tiger Lilly," "Kiss Me Kate" and "My Fair Lady" (and for that matter, Shaw's play, "Pygmalion" on which it was based was taken from a classic work by Ovid), every episode of "Mystery Science Theatre 3000," a favorite TV show among that crowd in those days. I also pointed out that most of them were familiar with old B&W films from TV, but who's to say that DW Griffith had a TV screen in mind when he filmed "Birth of a Nation?" And who governs the art police such a law would put in place? Whose to say that government bureaucrats have decent abilities to adjudicate the gray areas where new works of art are deemed "original" or "derivative?" Mike, given your full attribution of the original artists, you are working in the rich western tradition in the arts (in the east the notion of individual authorship is anyway far less important) of building on the work of the past and honoring it by giving it new life and new meaning. Also, I recently saw a fantastic exhibit at the UBS gallery in Manhattan of digitally reprinted works by Walker Evans. Some of them were side by side with the originals (or various "originals" a print in a book versus an individual print, versus the new digital print). This was an ambitious attempt to create prints that used new technology to deliver more of what Evans himself was striving for (or so they hoped). If it's legal and doesn't contravene the original artist's specific and unambiguously expressed intentions it's certainly legit. Even if it does contravene the artist's intent, if it's legal and the new interpreter makes clear his/her artistic intent, it may still be legit - would Da Vinci have sanctioned Duchamp's version of the Mona Lisa? It's a question that's hardly worth asking, though it seems both unlikely and beside the point. John Loengard's Celebrating the Negative has some interesting commentary on the relationship between the negative and the print. IIRC, Imogen Cunningham's son argues that there's absolutely no reason to prefer one of his mother's original prints over his own more recent prints from her negatives b/c his were cleaner and sharper. Obviously he was engaging in a bit of self promotion, but it raises an interesting point about whether there's some inherent reason to prefer her original prints and whether later prints from her negatives are somehow inauthentic. "I was happy when you mentioned that it would happen only on Friday." Nope, Friday and Monday. A print by somebody else on Friday, and a print of one of my own pictures on Monday. "the artist controls all aspects of the work and creates it exactly as he/she sees it at the time"
This is one valid approach to photography, but it is certainly not the reality of the medium, nor is it an attitude adopted by all that many photographers. If anything, photography's disconnect between the exposure and print processes not only encourages but requires interpretation, and therefore reinterpretation, whether by the shooter/printer or by another printer. HCB most famously believed in the idea of the photograph as a product of "the moment". Ironically, he preferred to leave the printing to craftsmen more skilled than himself, which I find doubly ironic, considering he aspired to be a painter. On the other hand, master printmaker Ansel Adams believed in the uniqueness of the photographic medium and in exploiting it's unique qualities, including the option to reinterpret. Let's remember that he made that "print is performance" statement at a time when he was producing some radical reinterpretations of his own negatives. Finally, as a photographer (and musician) who enjoys experimenting in the darkroom and still has much to learn about it, I resent the implication that I should avoid reinterpreting even my own work at a later time. Mike, I appreciate your position, and I have no problem with legally reproducing these images however, regarding Migrant Mother. I cannot tell from the screen how these will print but I think the dark brooding interpretation you have produced is unfortunately similar to an infamous print of O.J. Simpson's arrest photo which was rendered in high contrast and projected an "image" which was not necessarily accurate. The printer, by virtue of the limitations of the medium, must interpret the work of the original photographer but at what point does this interpretation actually produce a "new" image which may no longer reflect the photographer's original vision? I have been a regular reader since the SMP days, this discussion just reflects the life you bring to this particular art form, keep it up. There are tens of thousands—hundreds of thousands—maybe millions of fine old photographs languishing in archives, museums, libraries, historical societies, and estates all over the world. This takes me back to a book you reccommended - Angels World, edited by Michael Lesy (who, coincedentally is famous for Wisconsin Death Trip, which I believe features Migrant Mother). The forward in Angel's World is very much worth readins, especially the part about the face down daguerrotypes and the knowledgeable old archivist. Mike, I guess we will simply disagree on this one. There may be many artists who don't mind have their work reinterpreted by others without permission, but I also suspect many won't like it. As for Ansel Adams, I'm pretty sure he welcomed the posthumous reprinting of his work for educational purposes; I don't know that he contemplated someone charging for it. Why venture into gray areas when there is so much that can be done with your own work or for others at their request? A few things are leaping to mind after having read the comments. First, as pointed out, it isn't a legal question of whether Mike has a right to print. DL worked for the FSA, and the negatives are the property of the US Citizenry (not even to government. BTW, so is the formula and process for making Tang™. But the name is protected by trademark and probably copyright laws). Creative works commissioned and funded by the US Government are the property of the public. 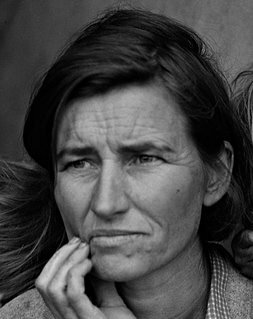 As for Dorothea Lange's intentions, we can only surmise. Personally, since she was working (not conscripted) for the FSA, I would expect she would want to have her work seen as widely as possible. She was, after all, doing documentary photography, and the point is to have your project seen. To address the printmaking issue, I'd point out that photographing and printing are two vastly different crafts. Excellence at one does not suggest excellence in the other. Are we to dismiss all prints made by a professional printmaker that are not the photographer? What about sample variation? Is one more pure than the other? As for the musical analogy, and the previous point, consider Igor Stravinsky's Rite of Spring. He considered Toscanini's recording with the NBC Orchestra to be the definitive recording, superior to his own recording. No wonder. Stravinsky was a composer, Toscanini a conducter. The creator of the beginning of the work is not necessarily the only one who can make great art from the base material. So how about the musical analogy from another angle? Was it George and Ira Gershiwn/Yip Harburg/Johnny Mercer; or Billy May/Nelson Riddle/Quincy Jones that made Frank Sinatra famous as a musical performer? Few arts are solo. In popular music, it was probably Hank Williams that first gained wide acclaim 'doing his own thing', aka writing and performing his own material. But certainly his producer influenced the work. Does that make a Hank recording less than true? And how about the myriad people who have followed, reinterpretting the Hank Williams songbook? What about Bob Dylan, who truly is an awful singer, and yet capable of interpretting his own work sublimely? Just like Hendrix, The Band, and Clapton. And don't get me started on the works of Lennon/McCartney. Adamei mentioned Woody Allen's 'What's New Tiger Lily?' as an example of a derivative work, but a more telling one in my opinion is Zellig, which used new and archive footage to place his titular character into historic scenes. Ironically, Allen led charges against Ted Turner's colorization campaign. BTW, I'm with Adamei on the colorizing issue. And I'll add another reason: To make a color print, they need to work from a pristine negative, so some classic films were restored as good as new to add color. Don't like it? Turn the color down. That's what I do. Given a choice between seeing colorized Arsenic and Old Lace in B&W with the color turned off, or pretty much anything else, I'll choose option one. But some folks will get exposed to the brilliant comedy that otherwise would have avoided it. Name me an artist that doesn't want their art experienced. On a side note, I read about the Migrant Mother photo, that DL only took the shot after having packed up her gear. She saw the woman playing with her children, and returned with her camera to take the shot. The expression is not one of sadness, she was just tired. Which was not to suggest that conditions weren't terrible for the migrant workers, but that particular instant in time belies the expression. Oh, that photography! It isn't true. You can't beleive what you see, the camera does, in fact lie. I'm glad patrickperez noted above that in order to colorize the old classics, much conservation and restoration had to be done, and was done, on the original BW stock. This one fact changed my attitude 180 degrees about the colorizing project, particularly as no one had been spending much money or effort to preserve these movies before Turner bought them and they might have been lost otherwise. Turner has also made the restored BW versions available on DVD and basic cable, while the colorized versions seem to have disappeared, at least from my awareness. If it turns out that the colorization project generated the cash to pay for the films and their restoration, I have to hail Ted Turner as a genius and savior of an artistic and cultural heritage. I hope he has profited well from his good deed, too. re Migrant Mother. I think it's a stretch to say that the meaning of the mother's expression has changed significantly, but I think it can be said that the drama of the image, and it's emotional content, has been heightened by the increased contrast, and that perhaps different aspects of her expression have been emphasized. Just because she was tired doesn't mean she wasn't also worried and anxious, or that all of these emotions and more would not show on her face at any given moment to be captured by the camera. Wouldn't you be feeling all of those things, if you were in her shoes? Indeed, I think the means and moderation Mike is employing here can bring out little that was not there in her face to begin with. What they can do is selectively emphasize among the many thoughts and feelings that appear to be playing upon it, letting us "read" things we might have overlooked in the past. It's akin to the difference we might have seen from a different lens, emulsion, exposure, developer, paper grade, etc. The Newsweek cover photo of OJ was the opposite in intent and effect. There, any expression was obfuscated in order to make his face essentially unreadable, and therefore sinister. "As for Ansel Adams, I'm pretty sure he welcomed the posthumous reprinting of his work for educational purposes; I don't know that he contemplated someone charging for it." Ansel Adams is protected from anyone economically benefiting since the copyright is privately held. Until the copyright expires (and if Disney et al. have their way, that will be never) his work will always be protected. The instant difference with the LoC scans is that US citizens are in effect the copyright holders. I have no idea how other countries address these issues except insofar as the same copyright laws are enacted among many countries in order to facilitate trade. But some countries do interesting things to further protect art. As an example, if I could somehow persuade the Louvre to sell me La Gioconda, I would be prevented by French law from defacing it by, say, painting on a moustache. In fact, I probably couldn't even remove it from the country. photo-essayist has a different viewpoint on what is right, and I fully respect his opinion. It reminds me of the debate on whether to remove a distracting element from a landscape. No right answer, but each photographer needs to decide for themselves, and stay true to their ideals. Personally, I disagree with him, but I don't think he's wrong. This might be a good time to mention the photo essay Ansel Adams donated to the LoC, documenting life at the Manzanar internment camp. Both the negatives and Adams' prints have been scanned and put online. Not his best work, but I'm sure of interest to printmakers and Adams fans as well as of social and historical interest. What do you say, Mike? It could be an interesting reinterpretation project. This has indeed been an interesting discussion.